A nice tourist album produced for the luxury department store Rowe & Co., containing 111 photographs, each numbered and indexed. The majority of photographs have been accredited to Felice Beato, considered one of the first war photographers and well known for his work in Burma where he had his own studio. Rowe & Co. whose beautiful building can be seen in the second photograph, was one of the British colonial emporia or department stores in Rangoon (as was Whiteaway, Laidlaw in Calcutta, Spencer's in Madras, Cargill's in Colombo and Lane, Crawford was in Hong Kong ). Established in 1866 as a drapers and general merchants by Mr RV Rowe, the Company published a 300-page illustrated catalogue four times annually, exhibiting wares from its various departments; of course, ladies' and gentlemen's outfitters, drapery, millinery, crockery & glassware, trunks, cutlery, watches & clocks, saddlery amongst others. A compilation of various writings on China, with steel engraved map, and 85 black and white woodcut illustrations. 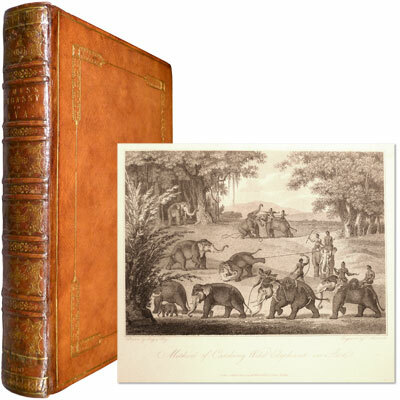 Beautifully bound in modern pictorial cloth. A large portion of the writing is from Julia Corner’s History of China, other authors include John Davis and Wells Williams. Old Burma - Eight Works on Burma in Four Volumes - U Myo Min, Taw Sein Ko, Ma (Daw) Mya Sein, F. Haskings, U Tun Pe, et al. 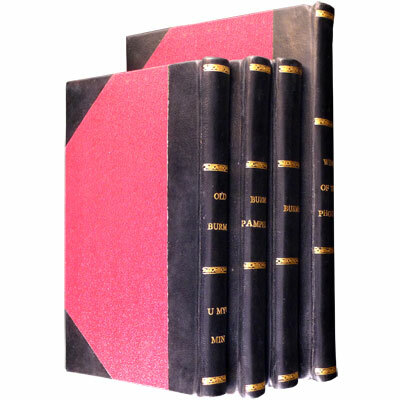 Eight works on Burma bound into four charming volumes for Charles Booth, British diplomat who served in Burma three times between 1950 and 1978. A compilation of memoir, history, and tourist guides to Burma, these books are profusely illustrated with maps, photographic plates, and illustrations, and will provide wonderful material for armchair travellers, and nostalgia to those who have already visited Burma. ‘Saki's own light-hearted contes cruels elegantly depict practical jokes gone wrong, childhood savagery, the inanities of country-house life or kindly, beneficent nature unexpectedly turning deadly, and yet they remain as fizzily delicious as a Pimm's cup on a summer's day’ - Janet Mullaney, Saki: A peerless writer mown down by the scythe of War. A bright copy,in the rare dust jacket, of ‘Saki’s’ posthumously published collection, featuring 8 short stories and 3 plays, a biography penned by his sister which includes Munro’s time in Burma (there is also a short story based in Burma), and numerous whimsical illustrative drawings by the author throughout. Perhaps the most graceful spokesman for England’s ‘Golden Afternoon’ – the slow and peaceful years before the First World War – ’Saki’s’ macabre, satirical, and occasionally supernatural tales skewered the banality and hypocrisy of polite Edwardian society, and established him as an undisputed master of the short story and one of the great writers of a bygone era. The important first hand military account of the first Burma war by Sir Archibald Campbell’s Military Secretary and son-in-law. A full margined copy in original boards and spine. With large folding engraved map Burmese Empire [46 x 40 cm], two wood-engraved illustrations Bandoola’s Look-Out Tree at Donoobew - Mounting Four Guns and Meeting of the British and Burmese Commissioners at Neoun-Ben-Zeik. Principal Figure: The Kee-Wongee. Rare set of eleven pamphlets, produced under the auspices of the Burma Research Society, inaugurated in 1910, and whose members included such luminaries as John Furnivall, Charles Duroiselle, May Oung, Gordon Luce and Pe Maung Tin. In addition to the incredible amount of well informed opinion and knowledge these pamphlets contain, they are profuesly illustrated with photographic plates, colour plates, drawings, diagrams, and maps. 1. Burma Background by B.R. Pearn – With three full page illustrations and one full page map. 2. Burma Setting by O.H.K. Spate – With two full page maps. 3. Buddhism in Burma by G. Appleton – With four photographic plates. 4. Burma Rice – With six photographic plates. 5. The Forests of Burma by F.T. Morehead – With seven photographic plates. 6. The Hill Peoples of Burma by H.N.C. Stevenson – With 19 photographic plates and one map to rear. 7. The Burman, An Appreciation by C.J. Richards – With six photographic plates. 8. The Karens of Burma by Harry I. Marshall – With eight illustrations (three full page) specially drawn by C. H. G. Moorhouse. 9. Burma Facts and Figures – Illustrated with schematics. 10. The Burma Petroleum Industry – With one folding map and 24 full page plates and diagrams. 11. The Birds of Burma - Bertram E. Smythies – With eight full page colour plates .